Barnes, who has recently taken a new position at Western Sydney University, specializes in creating simulations of alternate universes to see how space and time might have unfolded when the laws and constants differ from those in our own universe. In a series of forthcoming simulations, Barnes and his collaborators hope to untangle how symmetries and near-symmetries in the laws of physics affect the qualities of our own universe — and the smoothness or lumpiness of other potential universes. The types of symmetries Barnes is investigating relate to the interactions of particles across space and time. Some are perfect symmetries like electric charge, which is always conserved and zeroes out when you sum the relevant quantities before and after an interaction. Other symmetries appear to be perfect under normal circumstances but diverge in extreme conditions. 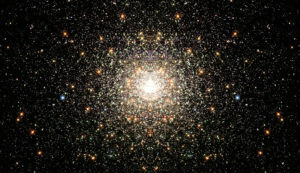 Still other symmetries break down entirely in certain circumstances: “At very high energies certain particles behave in ways that are perfectly symmetric, but as the universe cools, they start to behave differently and we then find strong asymmetries,” Barnes says. To construct and run his simulations, Barnes relies on collaborators including the Sydney University’s Geraint Lewis (co-author of their Cambridge University Press book A Fortunate Universe: Life in a Finely Tuned Cosmos), Pascal Elahi from the University of Western Australia, and Richard Bower and Jaime Salcido at Durham University in the United Kingdom. Barnes anticipates running ten or more different simulations, each of which will take two weeks of supercomputing time. The scope of the simulation is calibrated to match previous simulations that Barnes has conducted, including a control simulation run with our own universe’s physical properties. Each run of the simulation results in a wealth of data that then must be explored in a ways that are similar to astronomer combing through data from real-world observations. “One of the first things we do when we have a simulation set is to look for clumps of structure to determine where the dense bits are and where the voids are, and in particular to look for any object that is collapsed and bound together by its own gravity — that’s where you’re going to find a galaxy,” Barnes says. Learn more about the Australian National Telescope Facility’s EMU project. Order Luke Barnes and Geraint Lewis’s book A Fortunate Universe and watch a Cambridge University Press video of Barnes discussing the book.